Another new year is upon us and that means it’s time to file our 2012 tax returns. A lot of you probably wait in anticipation for your tax refund to arrive. The whole time you’re probably daydreaming about what you’re going to spend it on. Wouldn’t you love to learn how you can get that tax refund even faster? Plus you can enter to win $12,000 worth of groceries and $150 Visa Gift Cards! A faster refund. You don’t have to wait for a check to arrive in the mail or drive to the bank to cash it. It’s safer. No losing your cash because it’s all loaded safely on your Visa Prepaid card. Convenience. You can shop and even pay your bills online or over the phone. Use it to buy that item you’ve been wanting! How would you like to win groceries for your family? Enter for your chance to win groceries for your family valued at $12,000! Winning groceries could save so much money! Instead of spending that tax refund on groceries you can actually splurge with it and buy something you’ve always wanted. Entering is so simple! You just need to load your 2012 federal income tax refund onto a participating,eligible Visa Prepaid card between January 1 and April 15, 2013. Plus, when you use your participating, eligible Visa Prepaid card you will also receive an entry for a chance to win one of ten $150 Visa gift cards given away weekly. With the prize of a $150Visa gift card, you can pick your own reward. Get your eligible, participating Visa Prepaid card so you’ll be entered to win! DISCLOSURE: I am blogging on behalf of Visa Prepaid and received compensation for my time from Visa for sharing my views in this post, but the views expressed here are solely mine, not Visa’s. Discover more at http://www.VisaPrepaid.com or join the Visa Prepaid community at http://www.facebook.com/VisaPrepaid. This is a great way to get your refund! Visa Prepaid is the answer to getting a fast tax refund. Putting the refund on a Visa card is a great idea. That makes it very convenient for so many people. I had no idea that was a possibility. I think for people who do not have direct deposit as an option for their taxes, this is a very good alternative to a paper check. Good information. use a visa card deposit yyour refund on to the card and use it fast and free! I enjoyed the info on this card and how easy it is to get my tax refund on the card. Awesome that you can load your refund onto a pre-paid Visa! I didn’t know that! Thank you for informing me of the direct deposit and sweepstakes! I know nothing about tax refunds, thanks for the info! THIS is a good idea for people without a credit card. I hadn’t thought about being able to put our tax refund on a prepaid Visa. Quick and safe. Good idea for being able to use the money right away for those “When I get my tax refund, I’m going to buy…….” purchases. I thought about the prepaid visa card but since I e-filed, I decided to go the direct deposit method. No hassle for me and no worries. 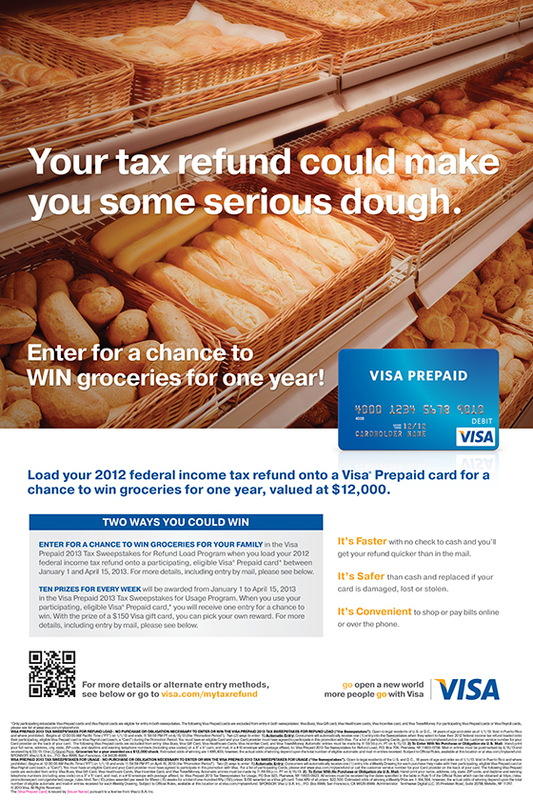 I learned that you will get the opportunity to win groceries for a year if you load your tax refund onto a pre paid visa! What an awesome idea to have your tax refund on a Visa debit card!! Now you dont have to worry about getting it cashed if you dont have a bank account.